It’s great to be back at UIUC, is it not? We’ve all missed our friends and our study sessions at the UGL. It’s a new year, and of course, a new semester. Most of you are familiar with the Undergraduate Library (spending those late nights working on a paper due the next day), but for those of you who are new, our library has a lot to offer you. Undergraduate Library. Photo Courtesy of Kosheahan via Flickr Commons. For research help, check out the Consultation Corner on the upper level. Here you will find a desk with librarians who will help you with your research needs. You will also find the Writers Workshop, if you need help with writing an essay and the Partners Desk. We have a loanable technology desk, right around the corner of the circulation desk (located on the upper level). Loanable technology such as laptops, iPhone chargers, cameras, sound recorders, and much more, are available for checkout. So, if you need some equipment for a class project, or want to work on your photography skills, come to the loanable technology desk! 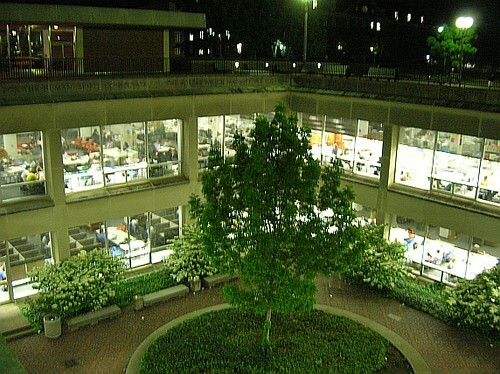 The Undergraduate Library has two levels, the upper level and the lower level. The upper level is where the circulation desk is located, as well as computers and the printing stations. This is also the level that has study group rooms. If you have a group project and need a space, be sure to make your reservation on DIBS. The lower level is the quiet level, so if you need a space where you need silence, the lower level is where it’s at. This level also has our media collection. Be sure to check out our DVD selection, music, and books on CD. We have a lot to offer, so if you have any questions, ask! We’re here to help you succeed. What are you looking forward to the most this semester? Leave a comment below. This entry was posted in Community, UGL News and tagged #clubugl, loanable technology, media, media commons, services by QLB. Bookmark the permalink.